WOKING manager Alan Dowson has no qualms about drawing Swindon Town away in the Second Round Proper of this year’s Emirates FA Cup. 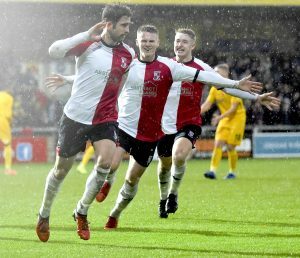 A hard-earned 1-0 win against league rivals Torquay United on Saturday booked Dowson’s side in the next round, winger Max Kretzschmar smashing home his sixth penalty of the season three minutes into the second half to the delight of the 323 travelling supporters. Speaking live on BBC2 from the Hampton & Richmond Borough’s Jezzards Beveree Stadium on Monday night, Dowson was notably pleased with the draw, citing it off camera as a “winnable tie” following the sacking of The Robins’ manager Phil Brown at the weekend. Swindon reached the second round following their 2-1 win at home to National League North side York City, but Dowson senses an opportunity for the Cards. “You always want to try and get a home draw, but if you happen to be drawn away from home, you want a league club, and we have. “Swindon are in a bit of disarray at the moment; they’re struggling at the wrong end of League 2 and they’ve just sacked their manager, so we’ve got the best chance we’ll have of going there and potentially causing an upset,” he added.